Felix de Beer, moulding technician at the Catharina Hospital in Eindhoven (the Netherlands), uses Orfit thermoplastic materials in rather unusual ways. One of the patients, René, has now expressed his wish to share a moulding technique that has severely improved his quality of life. In 2012, a brain tumour was found in Rene at very early age. To protect his skull, Rene had to wear a very eye-catching helmet. He found this to be annoying because it drew a lot of attention, which was the last thing he wanted. For this patient, Felix de Beer created 2 caps of Efficast 2,0 mm micro perforation, which he then integrated into a baseball cap. Rene could now go outside without being stared at. Brain cancer patient René needed protection for his skull. Integrating Efficast into a baseball cap was a perfect solution to camouflage this protection. Besides this patient, Felix de Beer has also helped other patients with his innovative moulding techniques. He made a similar baseball cap for a 9-year old patient that wanted to play hockey but couldn’t because of a fontanelle that was not closed. At the request of the little boy’s orthopedist, the moulding technician made a plaster cast of the boy’s skull, and then made a perforated mask on the plaster copy of the skull, which was then integrated into a baseball cap. The boy is now able to safely practice hockey without the other players noticing his protection. Another atypical application of thermoplastic material can be seen in professional sports, with protection masks for the face when the orbita, cheekbone or nose are fractured. 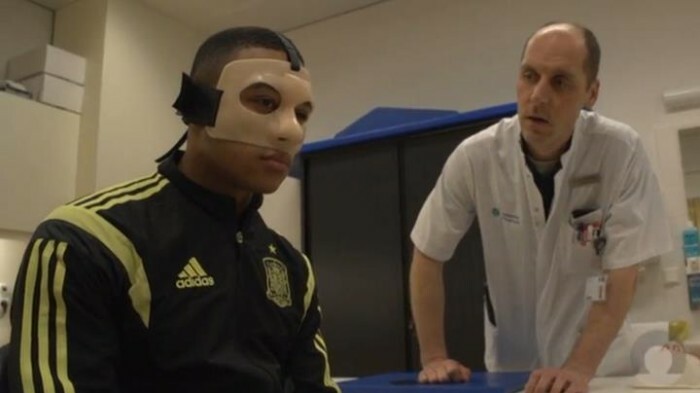 Recently, top soccer player Memphis Depay (PSV) needed such a mask.